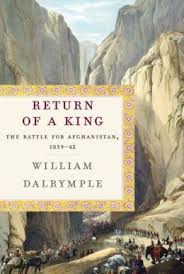 I Me My: Dalrymple's "Return of a King" The Battle for Afghanistan 1839 - 1842" - Lesson in History for Future Statesmen? Dalrymple's "Return of a King" The Battle for Afghanistan 1839 - 1842" - Lesson in History for Future Statesmen? How many of us living in the western world knew about Afghanistan before 9/11 happened? Afghanistan entered the world map of the western world only after Osama Bin Laden chose to make the Tora Bora caves his hideout in the aftermath of the 9/11 tragedy. Clearly Osama knew history better than most statesmen around the world, and hence chose Afghanistan to hide from the Americans, and he made a good call; Osama Bin Laden could not be tracked in Afghanistan even with the most advanced satellite technology prevalent at the time. Afghanistan has proved invincible to the mightiest of invaders, and history cites several examples of the indomitable spirit of this land and of its people. William Dalrymple, a British historian and writer has focused on Afghanistan as the subject for many of his recent writings. Recently, a relative who attended the Jaipur Literature Festival this year, of which Dalrymple was a co host, presented me with a signed copy of Dalrymple's latest book on Afghanistan, and what a read it was! The book captures the history of Britain’s disastrous attempt to get control of Afghanistan in the mid to late 1800s, summarized by an army chaplain of the time, Rev. G.R.Gleig, as ‘a war begun for no wise purpose, carried on with a strange mixture of rashness and timidity, brought to close after suffering and disaster…not one benefit, political or military acquired…Our eventual evacuation of the country resembled the retreat of an army defeated.” Dalrymple’s book highlights the similarities between what happened to the British then, in the 1800s, to the latest American invasion of Afghanistan in 2006, the West’s fourth war in that country! Given that Afghani topography, economy, religious zeal, and social fabric is still as it was 170 years ago, will the outcome of any invasion of Afghanistan be different from what happened with the British back then? The Afghani terrain is unforgiving to foreigners, a maze of mountains and caves that house a people unfathomable in their alliances and their loyalty. Dalrymple’s book asks some hard hitting questions such as: Why do we not learn from History? Why do leaders make ill informed decision that have potential for widespread disaster and suffering? Dalrymple’s book is revisionist in some ways as it documents an event in History using sources that have not been used in the past. Apparently, the author did extensive research in old forgotten libraries of Kabul where he bought personal libraries of book and journals written in the local language ‘Dari’. He procured this authentic and local piece of Afghani history at throwaway costs, and spent months and years getting it translated in order to re document the “Return of a King”, Shah Shuja, from a non-British point-of-view. According to Dalrymple’s sources, Britain in 1839 waged a completely unnecessary war based on “doctored intelligence about a virtually non-existent threat” of a Russian invasion, a rumor mongered by a Russophobe British ambassador. British colonialism, which had already established itself in India, perceived a threat from the Russians, and decided to act upon it with a naiveté according to Afghani sources. Some instances of this being: they walked into the unknown mountainous terrain of Afghanistan hoping to reestablish Shah Shuja, a king who even until 2001 was regarded as a symbol of treachery in Afghanistan, and who had earlier been deposed; they marched into a country without any real plans of how they’d get out of it. ; as invaders they wanted to challenge and change age old traditions of a people on pretext of ‘promoting interest of humanity’!! They even attempted to introduce western political systems in a country reputed for its tribal governance. Dalrymple’s riveting account of the First Afghan War is a comprehensive account about “The disaster of the Retreat from Kabul…a warning to the statesmen of the future not to repeat the policies that bore such bitter fruits in 1839 -1842.” Unfortunately, Afghanistan did get invaded again and the same mistakes were repeated; clearly, our statesmen either do not read history, or else the history they read is biased and inaccurate. Dalrymple’s novel makes a case for revisionist history, that which is based on documentation from both sides, the winners and the losers. The days of writing history from the winner’s point of view are gone; there is too much at stake to base future political action on a one sided history. Thanks for writing about this book because I am very interested in the subject. In the early seventies I have been there twice and had a really unforgettable experience. Quite possible: the next "visitors" might come from China and we should all wish them good luck, Afghans included because warfare is their passtime, suffering or not.